Come enjoy Bare Hugs,a Smoky Mountain paradise. This wonderful Studio cabin is the perfect location for your honeymoon or any romantic getaway in the mountains. With all the amenities you are looking for in a vacation home and more, a fully equipped kitchen, cable TV, VCR, Hot Tub on a covered deck, plenty of mountain charm and INCREDIBLE VIEWS. This custom built honeymoon cabin is just what you are looking for. Enjoy a relaxing evening soaking your cares away in the wonderful hot tub or just relax in the swing on the deck and soak in the majesty of the Smokies. Beautiful view!!!! Got an excellent deal and loved the cabin, the view and the ease of booking online. Was also able to check in and check out via text. Would recommend this! I will definitely be returning! Because of an accident and road construction we didn't get to the cabin until around 1 a.m.We couldn't find the cabin as it was so dark it made it very difficult. We called the number given to get help from the APG staff, she was so sweet and got concerned when we lost signal. When we finally got to the cabin she called to make sure that we made it alright. Jamie was a HUGE help and VERY sweet! This was my 5th stay with APG, I will be back!!! We had an incredible stay and vacation! The cabin was absolutely beautiful and wonderful. We will be back just as soon as possible. Thanks so much! The place was great!! Getting there was a little challenging but that view of the mountains from the porch have made it worth. Loved the cabin! Everything we needed. Couldn't beat the view from the porch! We will definitely be back. Very happy with our stay. Easy to follow directions. Check in was a breeze with lockbox code instantly texted to me upon arrival. Cabin had an amazing view, well stocked with nice dishes and cooking utensils, and very quaintly decorated. We enjoyed our stay immensely. The cabin was everything we expected & more. My wife and I could not have enjoyed a better 20 year anniversary. The view was amazing.Had the time of our lives. The view was awesome! Maybe sometime come back to stay in the fall. This was the perfect cabin for our 30th Wedding Anniversary. 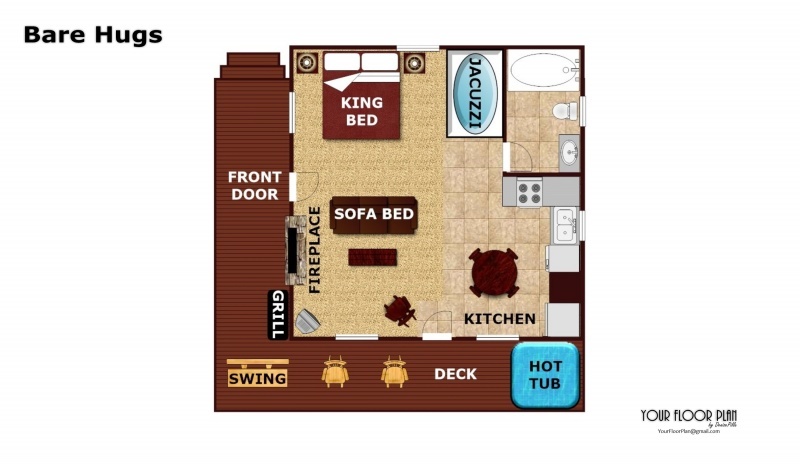 We had planned this trip for over 6 months and chose this cabin primary because of the websites excellent pictures and details of all the amenities. We found the cabin to be exactly as advertisedand were very pleased with the discounts offered for early booking. When we called to speak to the staff at APG, we were greeted with friendly courteous help. What a pleasure to actually speak to a person and not an automated machine. This cabin is centrally located to Sevierville / Pigeon Forge / Gatlinburg / Cades Cove and Tail of Dragon. We absolutely had an awesome time enjoying all the area had to offer and the cabin gave us a beautiful place to relax after our fun filled days. The views from the deckare just breath taking and we enjoyed every meal there on the deck. The nightly Dollywood fireworks that can be viewed from the deck at 930 every night was just an added bonus. We loved this cabin and APG so much that we would only use them again for ourvacation needs. We were on day 4 of our 8 day vacation at Bare Hugs discussing our dates for the 2017 Bare Hugs return vacation. And the cabin is so wonderful that we are planning on building a replica for our retirement. We have recommended the cabin andAPG to all our family and friends. Thank you APG for such a smooth process in the rental of Bare Hugs, the cleanliness of the cabin and the best value....that ended up making this the best vacation we have ever had in our lives. You are 5 Stars!! Would also recommend to other people. Had a wonderful Honeymoon. We have stayed at Bare Hugs before and will likely stay there again. We have stayed at other American Patriot properties and we have been pleased with every one. We will definitely use American Patriot Getaways again. I had the opportunity to speak with Angie in the office and she was most pleasant and helpful. Lynden and EricaWe had a great time! The cabin was beautiful, quaint, and very cozy. We loved eating breakfast and dinner out on the balcony everyday. You simply cannot beat the view we experienced. Everything about this cabin met and went above and beyond our expectations! Thank you American Patriot!